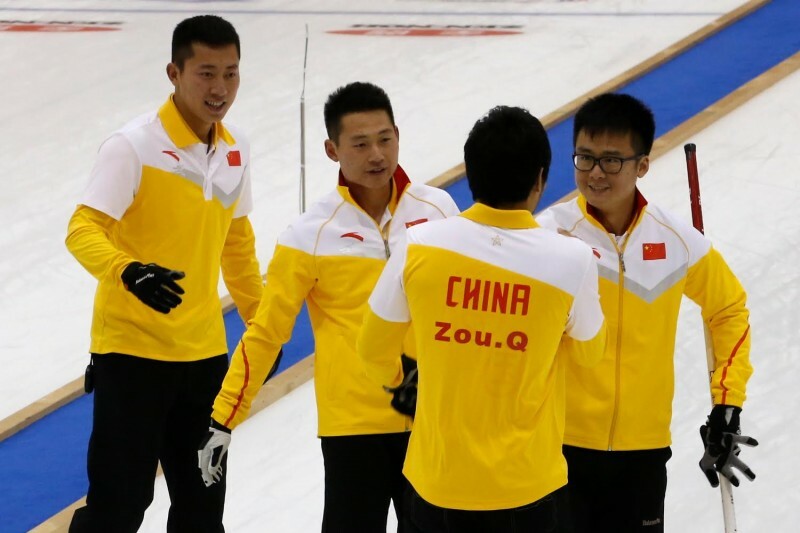 China men and women have qualified for the gold medal games at the Pacific-Asia Curling Championships 2014 after both winning their semi-final series this afternoon in the Karuizawa Ice Park Curling Hall. In addition to reaching the gold medal game, China men have also qualified their nation for the Ford World Men’s Curling Championship 2015 being held in Halifax, Canada next spring. The men’s last semi-final of their three game series proved to be yet another extremely close game, needing an extra end to decide on the winner. By the fifth end break, China were ahead 4-3. In the sixth end Korea skip Soo Hyuk Kim made a hit for one point before China retook the lead as skip Jialiang Zang was left with an open hit to score two points in the seventh end. Korea then blanked the next two ends looking for last stone in the tenth end. They used this to their advantage as some good setup play allowed skip Soo Hyuk Kim to draw around a guard with his last stone to score two points. The extra end came right down to the last stone. Korea skip Soo Hyuk Kim played a tap up to leave one of his stones guarded in the four foot ring. China skip Jialiang Zang then played a double takeout and roll to score one point, earn the win, secure a gold medal game against Japan and qualify his nation for the Ford World Curling Championship 2015. The women’s fourth game of their semi-final series was also extremely close. Japan took a crucial advantage in the game when skip Ayumi Ogasawara made a raise takeout for four points in the fourth end to take a 5-2 lead. By the fifth end break, China had pulled the deficit back as their skip, Sijia Liu made a hit for two points. China managed to pull level with Japan in the eighth end when skip Sijia Liu made a takeout for two points. Japan then tried to blank the next end looking for last stone advantage in the tenth end. However, skip Ayumi Ogasawara’s final takeout attempt stuck to give Japan one point. China then made some good setup play which forced Japan skip Ayumi Ogasawara to attempt a draw with her last stone. Unfortunately it was too light and with two Chinese stones already in scoring positions, they lost the game as China won 8-7. This was China’s third win in the best of five series against Japan, having won one game in the round-robin against them earlier in the week, and winning their semi-final game against them this morning as well. Japan have already qualified for the World Women’s Curling Championship 2015 as host, therefore the winner of tomorrow’s gold medal game will also qualify. The women’s medal games will both be played at 09:00 local time (JST) on Saturday morning. These will feature China against Korea in the gold medal game and Japan will play New Zealand in the bronze medal game. The men’s medal games will both be played at 14:00 (JST) with Japan against China in the gold medal game and Korea playing Australia in the bronze medal game. Both gold medal games will be televised by World Curling TV on Youtube.